A unique multicurrency and multi-timeframe strategy developed by a team of LATAlab specialists. 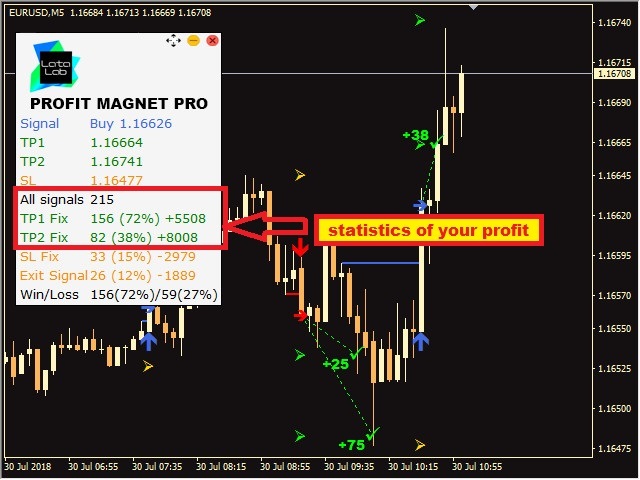 Strategy Profit Magnet PRO has been tested and verified by our team. This will allow you to earn maximum profit comfortably and efficiently. 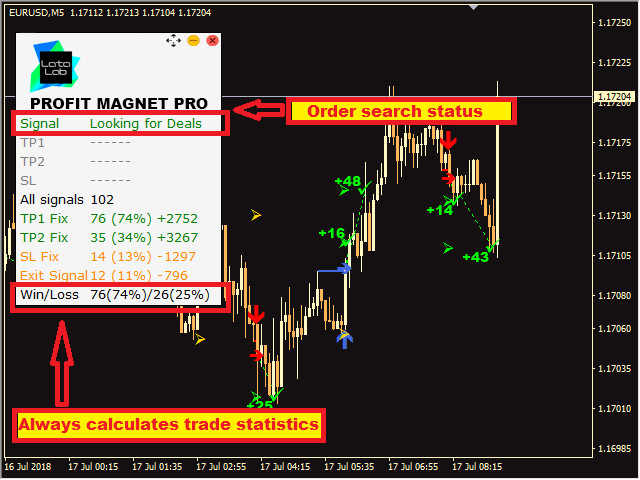 Profit Magnet PRO by LATAlab never redraws. Works on any trading symbol. Time frame - from M1 to MN. Automatically detects Buy, Sell, Take Profit, Stop Loss levels. The indicator is equipped with a convenient information panel in which all trade statistics are automatically displayed. Indicator has functions of pop-up notification, email notification, push - notification and sound alerts. A buy signal - a big blue arrow pointing up, a confirming blue arrow pointing to the right, is the best level to enter - open a Buy order. A sell signal - a big red arrow points down, a confirming red arrow pointing to the right, is the best level to enter - open a Sell order. Take Profit 1 level - the first profit target for scalping, displayed in the form of a green check mark directed to the right. 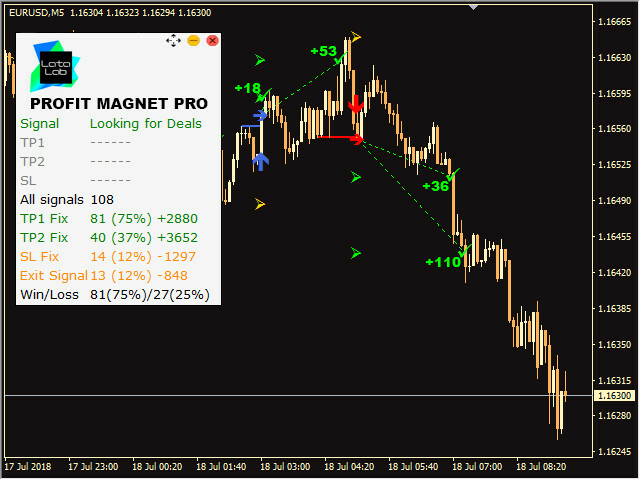 The Take Profit 2 level - the second (maximum) profit target - is displayed as a green tick directed to the right. For Buy orders, Take Profit 1,2 levels are located above the Buy arrow. For Sell orders, under the Sell arrow. The recommended Stop Loss zone is displayed as a check mark of orange color corrected to the right. Exit the buy signal with a new sell signal. Exit the sell signal with a new buy signal. Achievement Take Profit 1 one green check mark - the goal for scalping trading, we recommend fixing half the profit and moving Stop loss to break even. 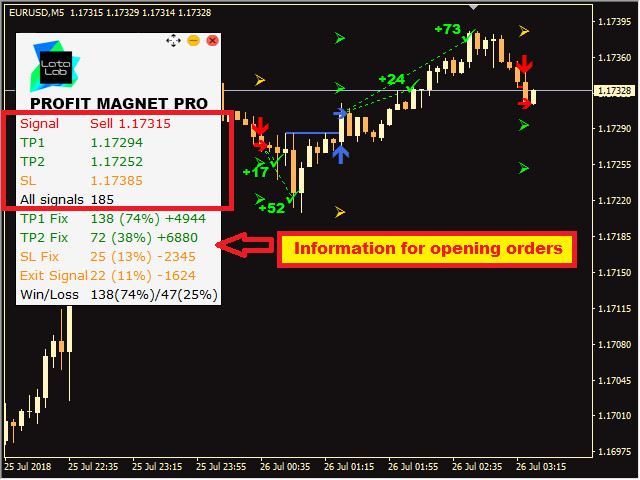 Achievement Take Profit 2 - close the order with a profit.